Johanna Rothman provides a third installment of the "Stuck in the Middle With Your Agile Transformation?" series, focusing on culture changes. In part 1, I addressed some management challenges with an agile transition. In part 2, I addressed some team issues. In this part, I’ll discuss why agile is a culture change and ways to consider a system change to agile. Agile looks something like this image. 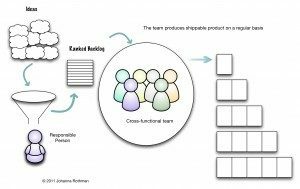 The responsible person (often called a product owner) collects ideas and creates a ranked backlog for a cross-functional team. The team works on the backlog, releasing small chunks of value. At some point, the team demos to the product owner, retrospects and gets an updated backlog. The team retrospects often enough to understand and fine-tune the team’s process. The team, including the product owner, retrospect enough to understand if the stories are small enough for the team to finish stories, and to change what the team works on when. Retrospectives include the product and the process. Culture change does not occur overnight. Change is hard work. If you are one of the people nurturing your agile change, I bet you feel stuck in the middle between other managers, the manager(s) and the team(s). I invite you to join us at the Influential Agile Leader (Boston Apr 6-7, and London May 4-5) this year.